It’s been a very busy week, but then again, I suppose nearly all of my weeks here have been and will be very busy. With only five week here, time seems to go by so quickly. Anyway, the first half of this week was consumed by finishing every possible sculpture I could, so they could be soda fired. The plan was to load the big bisque kiln on Monday, giving it plenty of time to cool before we loaded the soda on Thursday.It’s been a bit rough doing my main firing only 3 weeks into my time here, but fellow artist Jody was about to return to Canada, meaning if we wanted to fire together we had to fire this week. It’s worked out for me though, since I managed to finish 90 flying beasts, which wasn’t far from my goal of 100. So after about a full week of last minute frantic studio work, Jody and I loaded up the Guldagergaard wood-soda kiln on Thursday. The kiln is a small little beast, with a capacity of 300 liters/ 10.5 cubic feet. It’s also a very different type of kiln for me, since I’ve only really fired an anagama and a train kiln. This guy is a cross draft kiln, with a firebox located underneath the ware chamber. It’s weird. It wasn’t like stoking a firebox, it was like stoking a conveyor belt. It wasn’t so much much a rhythm of “stoke, see how the temperature responds, adjust”, as it was a constant process of stoking, gradually pushing the wood further in the the kiln, and constantly adjusting. It was like switching from a Sousa march to one of the Bach cello suites. Looking around online, it visually looks a bit similar to the “phoenix kiln” in a book by Jack Troy, which was mentioned on Carl Gray’s website. The main differences are the fact that the firebox has a flat, not arched roof, and the chimney is on the side, not the front. Anyway, due to some last minute kiln maintenance work, we didn’t get the kiln started until about 9pm on Thursday night. The plan was to fire for about 20 hours, waiting to put the soda into the kiln until cone nine on the bottom of the kiln had fallen. Sounds good, as far as plans go. However, life is seldom that simple. By hour 22 or so we had cone 9 down on the top, but had barely moved cone 8 on the bottom. It took easily another 4 hours of struggle before finally dropped the lower cone nine, by which point we’d also dropped cone 11 on the top of the kiln. In all, the firing took us 28 hours, which was pretty exhausting for just two people, especially since we were also constantly splitting more wood. Richard, the tech, had to leave for the night before we were ready to put the soda in the kiln, but here’s a shot of him explaining the soda balls to us. We were using a method developed by Gail Nichols, generally referred to as soda balls/bombs/burritos. In previous soda firings that I’ve done, people have used the more traditional method of spraying in a mixture of water, soda ash, and sodium bicarbonate into the kiln. However, it seems like Nichols’s soda bomb method is taking off, which is understandable if you’ve seen how amazing her work looks. Basically, you mix soda ash, sodium bicarbonate, and whiting together, and add just enough water to form it in to balls. 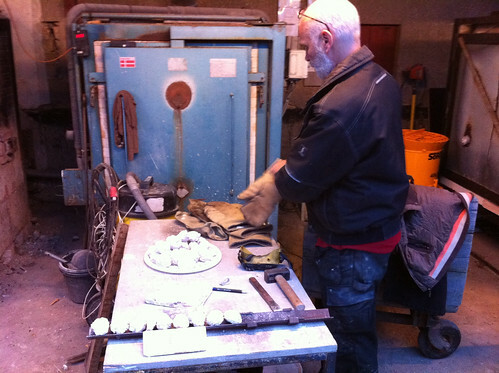 These balls then solidify to rocks, which you then dump into the firebox. 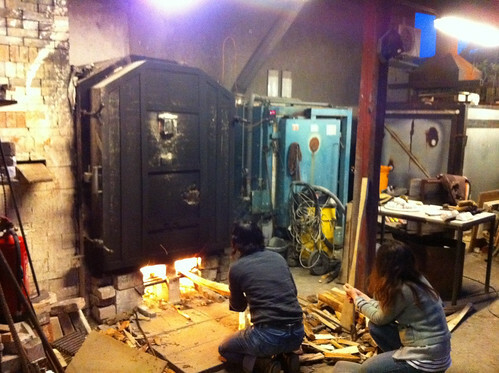 The soda then vaporizes in the firebox, distributing itself around the kiln. I haven’t done much soda firing, but I would love to play around with it some more if the results from this firing are promising. Anyway, at this point, we’re stuck waiting for the kiln to cool, and catching up on sleep. I’ll let everyone know what the results look like once we unload it! Off to the wood firing! As folks who have been following my twitter might have guessed, I’m about to head out for a woodfiring! 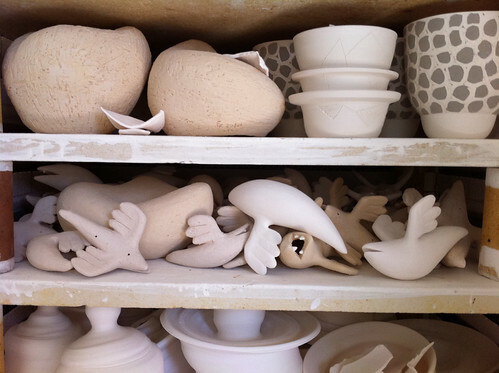 I’ve just finished packing up several months worth of critters, who will loaded into the kiln this Saturday and Sunday. They’ll be unloaded in two weeks on Saturday, November 28th. Most of these guys will then be going directly to the Island Gallery on Bainbridge Island, for their December show, “Beauty and the Beasts”. I’ll be featured along side their annual fashion show. Some will be coming to my studio’s annual holiday sale and party. Stay tuned to my twitter for updates on the firing! All of my newest work is now up on flickr. Enjoy! Kiln Unloaded and Off to NCECA! We unloaded the kiln on Saturday, and it looks like a great firing. I’ve spent the last two days trying to clean up all of the work, and sort it as to where it will be going. Most of the beasts came off of their wads cleanly, meaning there wasn’t too much work to do as far as that. What was harder was deciding where each piece should go. I’ve set aside four to submit to jurried shows, another four or five to send to a show in Idaho, about 10 to take with me to Japan, and another 10 to 12 that will be for sale online. They’ll all be showing up online at around noon (PDT) on April 18th – so if you feel like buying a piece, check back near then! I’m also finally all packed up for NCECA. I’ll be spending four days there, and then camping in the area with my dad, my brother, and my brother’s wife. It should be a lot of fun! 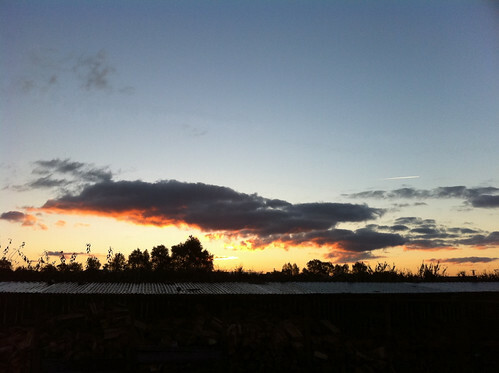 I’m back from the woodfiring, and have finally had a chance to relax, and get caught up email and so forth. Overall, I feel like it was a pretty solid firing. There were no crisis and no drama. Everything went as planned. We dropped cone 13 in the front of the kiln, and were probably in the cone 12 range in far back section of the kiln. That’s fairly standard, and where we like to be. We kept front of the kiln over 2300f for a day or two, though we would have liked the back to be hotter. It was generally in the 2100’s for the last couple days, seldom staying in the 2200’s, which would have been nicer. Regardless, there’s not too much point in speculating until we unload it on the 4th. It’s going to take a few days for me to sort and clean all of my new work. I need to decide which pieces will be traveling to Idaho for a show at the Art Spirt Gallery, and which pieces will be coming with me to Design Festa in Tokyo. However, it’s my goal to to have all the photos go online, and new pieces for sale on the 18th. I’ll post more information after I’ve unloaded the kiln. All my firing photos are up on flickr now. Enjoy!